1961 U.S.G.S. 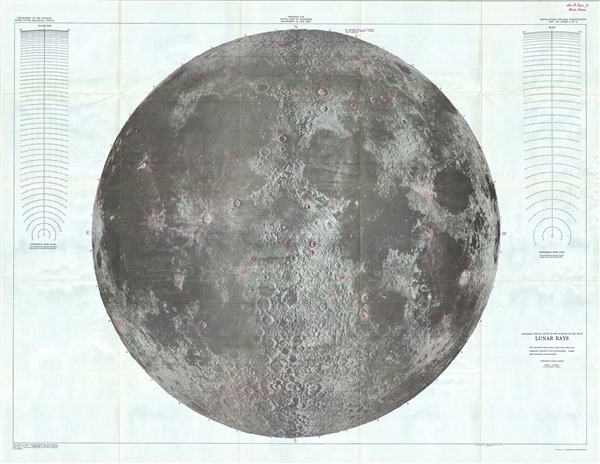 Lunar Ray Map of the Moon (wall map) - landmark Lunar map! Important Moon map made for the Apollo 11 Lunar Landing. Engineer Special Study of the Surface of the Moon, Lunar Rays. A 1961 landmark study of the Moon made by the U.S. Geological Survey in preparation for the Apollo 11 Lunar Landing Mission. Represents the near side of the Moon on a scale of 1:3,800,000. This spectacular monumentally proportioned map details the physical geography of the moon, noting craters, seas, mountains, and other formations with special attention to 'lunar rays.' Lunar rays are the steaks of fine ejecta, appearing almost like the spokes of a wheel, surrounding many of the moon's largest impact craters. The work done in compiling this map led Hackman to develop the basis for all future planetary mapping. Author C. Clarke's lunar explorers used this map for their 'Journey by Earthlight' in 2001: A Space Odyssey. Originally prepared by the scientists Robert J. Hackman and Arnold C. Mason in 1960 based on photographs taken at Lick Observatory, San Jose, California. This is the second edition issued in 1961. Hackman, R. & Mason, A., Engineer Special Study of the Surface of the Moon, 1861 (2nd edition). Near flawless. Original folds. No damage or discoloration of any sort. Clarke, A. C., 2001: A Space Odyssey, 'Journey by Earthlight'. Lunar and Planetary Institute, USGS I 351.